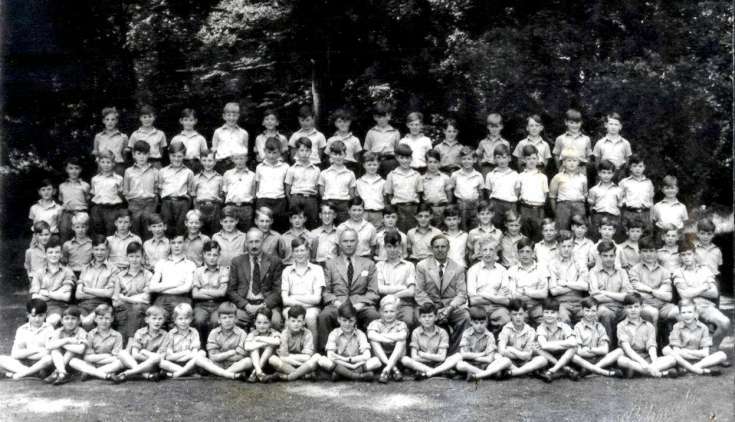 Here follows a small collection of photographs of Ashfold School in Handcross from the 1950s. There were notes attached which say that the teachers from the left are Mr Miere, Mr Seccombe, Mr Jim Harrison and Mr Richard Sykes. Also, one pupil has been identified, being Simon Baddeley who is the boy to the right of the boy behind Mr Sykes. However, I can only find three teachers on the photograph, the last being Mr Sykes. I presume Simon is the boy whose mother uses Persil for extra whiteness! Select Open Document to view, firstly, plans of the school and surrrounding area, with a very bendy Horsham Road! There then follows part of a map from 1873 showing Ashfold House at the bottom and Ashfold Farm on the right.